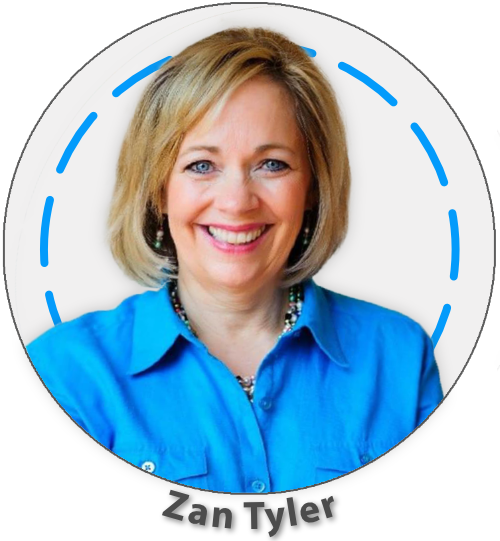 Zan Tyler is a respected author, consultant for BJU Press and the Home School Legal Defense Association, and is the founder of the South Carolina Association of Independent Home Schools (SCAIHS). She is also the former director of Apologia Press and derives deep joy from speaking to and encouraging parents across the country and around the globe. Zan and Joe Tyler have been married for 32 years and successfully homeschooled each of their three children from kindergarten through high school. Most importantly, the children continue to love the Lord and remain very involved in each other’s lives. Downloads available for workshops designated with icon. In 1984, the State Superintendent of Education told Zan Tyler that he could have her put in jail for homeschooling her son. Zan knew this was no idle threat. The shock and fear that riveted her and the imminent threat of being jailed forced her to count the costs of homeschooling and decide if it was really worth it. Zan learned some powerful lessons about fighting for freedom, family, and faith that remain pertinent today. Our nation is once again at a crossroads where the liberties we often take for granted are at stake. We must all continue to work to preserve our homeschool freedoms, while intentionally raising up a new generation of freedom fighters. But how do we do that? Come to this session to be encouraged and equipped with powerful principles to share with your children and teens. The frenzied push for education begins earlier and earlier in today’s society. In our world of preschool-mania, some parents pay hefty amounts to consultants who can help get their youngsters into just the right preschool. Other concerned parents are putting their preschoolers on waiting lists years in advance—sometimes even while the child is still in the womb! So what constitutes a meaningful preschool education that prepares a child for a life of learning and significance? In this workshop, we will discuss learning theories as well as practical skills you can teach your children. We will also cover how to develop a love for books in even your most active little ones. Join Zan Tyler as she addresses four vital components of a superb preschool education—and be encouraged that home is indeed the ultimate preschool! In a traditional classroom environment, students have an average of eight to ten individual interactions with their teacher each day. In your homeschool, these verbal interactions can number in the hundreds and greatly enhance the education your children receive at home. Zan Tyler shares how the simple and free tool of conversation can help your children replace boredom during lessons with a motivation to learn. Discover why parents make the best teachers and capitalize on these strengths. Explore strategies to minimize conflict in your home and promote camaraderie, enthusiasm, and learning with stimulating academics instead. Conversation is the key! Conversation IS core curriculum. From teaching phonics to graduating teens, from refereeing fights to nurturing faith, our lives as homeschooling parents run the gamut from the very mundane to the very meaningful. In the midst of the mind-boggling demands of homeschooling and everyday life, we constantly need to remind ourselves that our work as homeschooling moms and dads has tremendous Kingdom significance. Using the lessons of Scripture and history, this workshop will expand your vision of how God is using the homeschool movement, as well as your specific work as a homeschooling parent, to usher in spiritual and educational revival. Our children live in the midst of a secular culture facing a host of issues and moral dilemmas that we never had to deal with at their age. Because many children are not prepared to counter this culture, startling percentages of those raised in evangelical homes abandon their faith and beliefs as they move into adulthood. For this reason, training our children to develop a strong biblical worldview is one of the most important things we can do for them. Teaching them to think biblically about all areas of life equips them to become powerful thinkers, leaders, and communicators. Most importantly, it also gives staying power to their faith as they face opposition. Do you ever have those moments of panic when you wonder if you are giving your children everything they need to succeed in life? Do you worry that you are inadequate for all that homeschooling requires of you? Do you ever wake up in the middle of the night plagued by the long list of important things that still need to be done—and know there will never be enough time in the day to accomplish them? In this session, we will discuss five areas that pose particular challenges to homeschool moms and be reminded that He always holds us in the palm of His hand. Join Zan and be encouraged by the God’s promises of hope, strength, power, and help for those of us who are weary and imperfect.